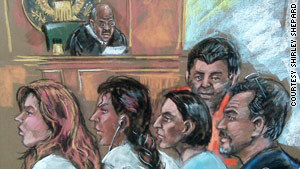 From left, Anna Chapman, Vicky Pelaez, Cynthia Murphy, Richard Murphy and Juan Lazaro appear in court Monday. (CNN) -- A suspected Russian spy is missing after being arrested in Cyprus and released on bail, a police spokesman told CNN Wednesday. Authorities arrested Robert Christopher Metsos, 55, in Larnaca after an Interpol "red notice" was served on him, Cypriot police said Tuesday. Police said he was released on bail pending further proceedings but was told not to leave the country and was ordered to check in nightly with police. He did not check in Wednesday and police are searching for him, a spokesman said. Metsos is among 11 suspects in an alleged Russian spy ring in the United States. At the time of his arrest, he was traveling on a Canadian passport and was about to board a flight to Budapest, Hungary. Metsos faces extradition to the United States. His disappearance came two days after the U.S. Justice Department announced the arrest of 10 people on charges of being Russian agents involved in a long-term mission in the United States. Five of the suspects appeared in a New York courtroom on Monday. Four of the five, including a longtime U.S.-based columnist for the Spanish-language El Diario newspaper, were advised of their rights and ordered held due to flight risk, with their next hearing scheduled for Thursday. The other defendant, identified in a court document as Anna Chapman, was denied bail. No additional hearings have been scheduled. The Russian Foreign Ministry said the suspects committed no actions directed against American intereststhe and the arrests are "unfounded and have unseemly goals." "We do not understand the reasons why the U.S. Department of Justice has made a public statement in the spirit of the Cold War," said a statement on the ministry's website. "Such incidents have occurred in the past, when our relations were on the rise. In any case it is regrettable that all these things are happening on the background of the 'reset' in Russian-U.S. relations announced by the U.S. administration." Russia's prime minister, Vladimir Putin, said American police were "out of hand" but expressed the hope that relations would not be harmed. "I hope the positive developments that have been accumulated recently will not be damaged," Putin said. On Wednesday, Assistant Secretary of State P.J. Crowley said the State Department had no plans to expel any Russian diplomats over the matter. "I'm not projecting any diplomatic consequences other than the good will that we hope will be there going forward to continue to focus on the issues where we agree and work constructively on the areas on which we disagree," Crowley said, adding that officials throughout the State Department had been in touch with various levels of the Russian government to discuss the issue. "As we've made clear -- and as I think officials in Moscow have made clear -- we are going to work as hard as we can to move beyond this and continue to focus on the many issues with which we have common interest," Crowley said. "Our focus is on the process going forward." The Justice Department said the suspects were supposed to have recruited intelligence agents, but were not directly involved in obtaining U.S. secrets themselves. They were charged with acting as agents of a foreign government, and nine also were charged with conspiracy to commit money laundering. The charges include conspiracy to act as an agent of a foreign government without notifying the U.S. attorney general, a crime that carries a maximum penalty of five years in prison, the Justice Department said. Conspiracy to commit money laundering has a maximum penalty of 20 years in prison. The case resulted from a multiyear investigation conducted by the FBI, the U.S. Attorney's Office for the Southern District of New York and the Justice Department's National Security Division, according to a Justice Department statement. The 11 suspects were charged in two separate criminal complaints. CNN's Terry Frieden, Jill Dougherty, Michael Schwartz, Arkady Irshenko, Elise Labott and Carol Jordan contributed to this report.